Our ears are among the body's most complex organs. 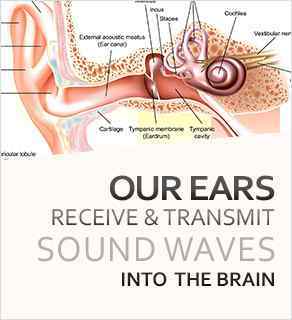 They receive and transmit sound waves into the brain where they are analyzed and interpreted. These bones are commonly referred to as the hammer, anvil, and stirrup and they connect the eardrum to a membrane between the middle and inner ear, known as the "oval window". The movement of the oval window transmits the presurre waves of sound in to the inner ear. The inner ear is fluid-filled and consists of the spiral-shaped "cochlea".